Battery (electricity), electrochemical cells to transform chemical energy into electricity. A set of electrically connected electrochemical or electrostatic cells (Wikipedia). (law) Act of inflicting unlawful physical violence to a person, legally distinguished from assault which includes the threat of impending violence. A coordinated group of artillery weapons. (baseball) The catcher and the pitcher together. (chess) Two or more major pieces on the same rank, file, or diagonal. Improved graphics at the expense of battery life was a tradeoff the designers were willing to make. The Napier of Magdala Battery never fired a shot in anger: it never engaged in combat. 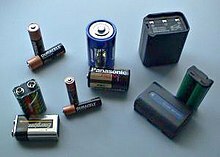 Meaning of battery for the defined word. Grammatically, this word "battery" is a noun, more specifically, a countable noun.